Origin of the Stock Market Terms "Bull" and "Bear"
Kevin asks: Why do we call the stock market trends “bullish” and “bearish”? For those who don’t know, a “bear” market, or when someone is being “bearish” in this context, is marked by investors being very conservative and pessimistic, resulting in a declining market generally marked by the mass selling off of stock. 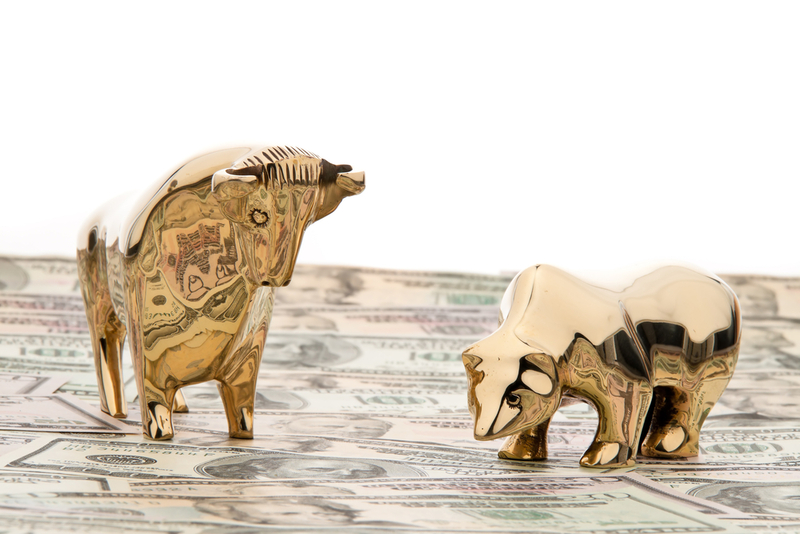 A “bull” market is simply the opposite of that, with investors being aggressive and positive, with stock prices rising as a result of this optimism. This “bull” and “bear” terminology first popped up in the 18th century in England. By the early 18th century, when people in the stock world would sell something they didn’t yet own (in hopes of turning a profit by eventually being able to buy the thing at a cheaper rate than they sold it, before delivery was due), this gave rise to the saying that they “sold the bearskin” and the people themselves were called “bearskin jobbers”. Those who buy Exchange Alley Bargains are styled buyers of Bear-skins. Thanks to this deal and an amazing amount of government corruption, insider trading, and other unscrupulous practices by certain shareholders who knew well that the company’s trade business had little hope of ever being profitable, the burgeoning company’s stock soared. At its peak, based on the stock price, the company was worth about £200 million (by purchasing power, today this would be about £24 billion or $37 billion; by average earnings, it would be £350 billion or $537 billion). Besides the fact that they didn’t even have their first trading shipment until 1717, 6 years after the trading company first formed, one of the problems was that having an exclusive monopoly on trading to South America from the British government at the time wasn’t saying much as most of the region was almost entirely held by Spain, who Britain was at war with. Nevertheless, amid rampant and widely published rumors (deftly planted by certain stock holders to jack up the price) of the vast wealth from gold and other resources in those regions and the potential promise of soon securing trade rights from Spain, the stock prices soared, even though the company itself wasn’t really doing any actual trading and their main asset, the monopoly on trade to Middle and South America, was essentially worthless, as the core stock holders knew well. Spain did eventually grant the South Sea Company rights to trade in the regions held by Spain, but only one ship load per year total was allowed in exchange for a percentage of the profits. Needless to say, the inability to do any actual real volume of trading and the fact that war once again broke out in 1718 between Spain and Britain causing much of the company’s scant physical assets to be seized by Spain, the market crash that followed wasn’t pretty. As to the “bull” name for rising markets, in this case we have to do a little more speculation as the documented evidence just isn’t there. The leading theory is that it came about as a direct result of the term “bear”. Specifically, the first known instance of the market term “bull” popped up in 1714, shortly after the “bear” term popped up. At the time, it was something of a common practice to bear and bull-bait. Essentially, with bear baiting, they’d chain a bear (or bears) up in an arena, and then set some other animals to attack the bear(s) (usually dogs) as a form of entertainment for spectators seated in the arena. In any event, the popularity of bear and bull baiting, along with perhaps the association with bulls charging, is thought to have probably been why “bull” was chosen as something of the antithesis of a “bear”, shortly after “bear” first popped up in the stock sense. But, of course, we can’t be at all sure on this one as there wasn’t the more lengthy documented progression of definition as with the “bear” term. 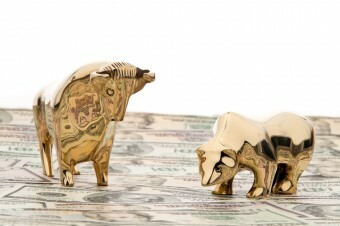 A common myth often put forth as to the origin of “bull” and “bear” market terminology is that it comes from the last names of two prominent banking businesses, the Bulteels and the Barings, the former supposedly tending to be extremely aggressive in their investments and the latter supposedly being much more conservative. While both the Barings bank and the Bulteel bank did in fact exist, there are a couple problems here. The first is that the only Bulteel bank around this era wasn’t prominent at all, certainly not enough to spawn such a term. Second, and more importantly, is that both the Barings bank and the Bulteel bank were founded well after “bull” and “bear” were already common stock market terms. Actually, the terms referring the way in which the animals attack their prey. A bear Will stand straight up, and slash downwards at his victim. A bull will start with his head low and thrust upwards with his horns to gore his target. Thus, a Bear market is one in which prices are high and them go low, and a Bull Market is one in which prices are low and then go high. @KnowledgeDropper: That is a common conjecture, but isn’t backed up by any documented evidence, unlike the above. “very laughable?” Oh men, those are very sick people. Yaiks.. The Bear is brought into the pit. The Pit is where they fight. The Bull is the dog in the fight. The British Bulldog and the American Pitbull. The Bull fights the Bear. The Economy is to save and conserve the wealth, spending wisely. The Bear holds up the economy. The Holding up slows things down, but conserves or saves what is there. The Bull tears down the economy. The Pit is the natural home of the Bull. Bear claws are downward meaning when the the stock are “bearish”, stocks are low or down while the horns of a bull are upward meaning if the stocks are “bullish” the stocks are high. I guess.